Find the perfect gifts to help form a positive relationship with your community! Offering customized gifts to current and potential residents forms an initial welcoming relationship between them and your community. Gifts are not only useful to recipients but are often retained and kept for extended periods of time. According to PPAI (Promotional Products Association International), 81% of recipients keep promotional giveaways for more than a year, allowing them to act as a recurrent message for your brand. This type of outreach can be more personal than signage and flyers, allowing your prospects and residents to feel valued. These are gifts that keep giving, by allowing your residents to see your community in a positive light and hopefully form a long-lasting relationship. Small gifts to prospective residents will allow them to keep your multi-family community in mind when it comes time for them to find a new home. Allow these gifts to enhance prospect’s first impression of your communities. Whether they are actively seeking a new home or might be in the coming years, it is likely that prospective residents will remember your community more if they have a gift to remember it by! Using the product will always remind them of your community, and it might even prompt them to visit or recommend it to a friend. The wide variety of gift options available allows you to choose those that best fit your multi-family community. For example, you can choose seasonally relevant products depending on your property’s climate, i.e. sunglasses for properties near the beach! These small gifts are a small investment that can result in a widespread awareness and a positive reputation for your multi-family housing community for years to come. 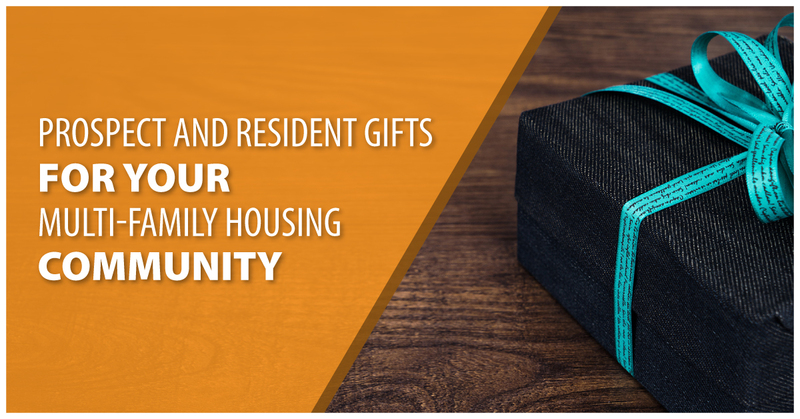 In addition to prospective customers, gifts are extremely important to your residents as well! Customer service and hospitality are extremely important in the multi-family housing industry. Providing residents with a gift upon signing a contract or move-in day will allow them to realize your company values them from the start. Receiving gifts creates instant satisfaction for many people, so this creates a positive relationship between recipients and your company. This small act of kindness from your company can go a long way in the minds of your residents by making them feel respected and welcomed in your community. After all, residents chose your community over all others, so this is a great way to thank them. We recommend selecting functional gifts that might have a higher perceived value for residents than the gifts given to prospects. This way, residents feel even more valued and celebrated by your company now that they’ve chosen to live in your community!